It feels great. We make people less productive at work, turn them into the hated know-it-alls at their pubs and leave them paranoid about their fantasy stars doing an ankle on the walk into the ground on match days. But somehow they blame the footballers in their fantasy squad for all of life’s problems. 2) What kind of year has 2010 been for NCNB? 2010 was a banner year for the NCNB team and community. It was the first time we ever qualified for writing about the FIFA World Cup, and our first ever company wide field trip to South Africa. Without a doubt, the proliferation of social media and our friendship with other bloggers. We will always write original content, have bring on guest authors and contributors, and continue to maintain our honest “voice.” But now, we are no longer just writing for ourselves, our families, and friends – we have a truly international community. This month alone, we counted visitors from 161 countries and territories – proving that football is truly the globe’s beautiful game. Our friendly bloggers / Twitter followers / friends have helped us make this international expansion by spreading our links to their friends and sharing our content with their eyeballs. We’ve been generous in our reciprocity – linking to footie related articles from around the web that we find interesting, and this karma has led to a massive increase in traffic and an enhanced reputation. You’re asking Chris Hughton to vote for Alan Pardew? Or Juande Ramos to give the nod to Harry Redknapp? Come on? 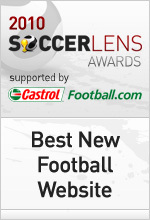 But more seriously, we are privileged and honored to be named alongside such other great footie related websites. Kickette does a superb job appealing to both male and female readers (guys won’t admit it but I promise they read it). Zonal Marking is one of the best reads from a tactical perspective on the web – a bit technical for the mainstream, but perfect for our taste at NCNB. As current and former players and managers, we love it. And any site that can include the suave Jose Mourinho in it’s site banner gets an extra bonus point or two. Lastly, we love 11Kicks – it is a fresh take at fantasy football and one that we believe will certainly see greater adoption as more casual fans turn to online gaming around major sporting events. 5) What’s next for NCNB? We’re taking it one season at a time. We have the ambition of say, a Sven-Goran Eriksson or Gus Hiddink, but at this point we are worried more about domestic trophies and perhaps a late run into a continental competition before we get ahead of ourselves. We are always looking for guest bloggers and new authors to join our community. Those obsessed with statistics, fantasy football, and/or funny viral videos are encouraged to reach out to us and join the team. A great sense of humor and ownership of at least one Romario, Cantona or Ronaldo (the original) jersey is recommended but not mandatory. I’ve certainly seen the rankings. I think, like any other ranking system, algorithm, or football debate there will always be two football fans with three opinions. At the moment, I agree that Messi and Ronaldo are the two best players in the world. It disappoints me a bit that I follow the Premier League so closely whilst two La Liga studs sit at the top of the world rankings. They are the best, little argument is needed there. After those two, I think it’s wide open. I think the rankings are a bit off at the moment. Take Wolves’ goalkeeper Marcus Hahnemann for example. No offense to the American goalkeeper, who is a fine shot blocker and wears the small patch of facial hair just below his lower lip and above his chin very well, but he’s not amongst the Top 30 players in the world. (Currently listed at 28 ahead of the likes of Fabregas, Berbatov, Ozil). Raise your hand if you think Hahnemann is better than even one of those three players. I doubt anyone just raised their hand.